The scenario shows a simple synchronous interaction between sender and receiver, as previously described in the SMSP examples. 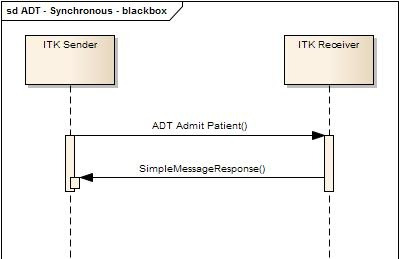 This example is drawn out to show how the ITK Reference Implementation manages the transmission of messages in non-xml format. In this case an HL7v2 ADT message in traditional “pipe and hat” format is packaged up and sent over the wire with no implications for the sending application and very little configuration. Although not shown here, the implications for the receiver are similarly simple. The Receiver consumers the SOAP message. This validates the SOAP headers and then extracts the payload. The SOAP payload is then split further into Distribution Envelope and business payload. The Distribution Envelope is validated and extracted into MessageProperties. The R.I. then looks up the service properties from the configuration and – in this case – as the payload is in base64 form it is decoded before being packaged up as a SimpleMessage and passed onto the Application Message Handler. // Send this message synchronously. A raw HL7v2 message in p/h format would not be valid data if just wrapped up in XML, so the ITK R.I. needs to know that this message is p/h so that it can construct the on-the-wire message accordingly. The R.I. uses a service.properties file to contain service configurations such as this. The Reference Implementation uses the service configuration to encode the message using core java language conversions. Now the R.I. sets the mime type, base64 encoding to the appropriate values and embeds the encoded message as the payload.